I love making Ravioli. It’s a time consuming process, but it’s one of those dishes where you can personalize to your own taste, and it’s something fun that you can do with a friend or your family. You can also make them in stages if you don’t have a whole day dedicated to them, and the ravioli can be made ahead of time and frozen and be good for weeks. 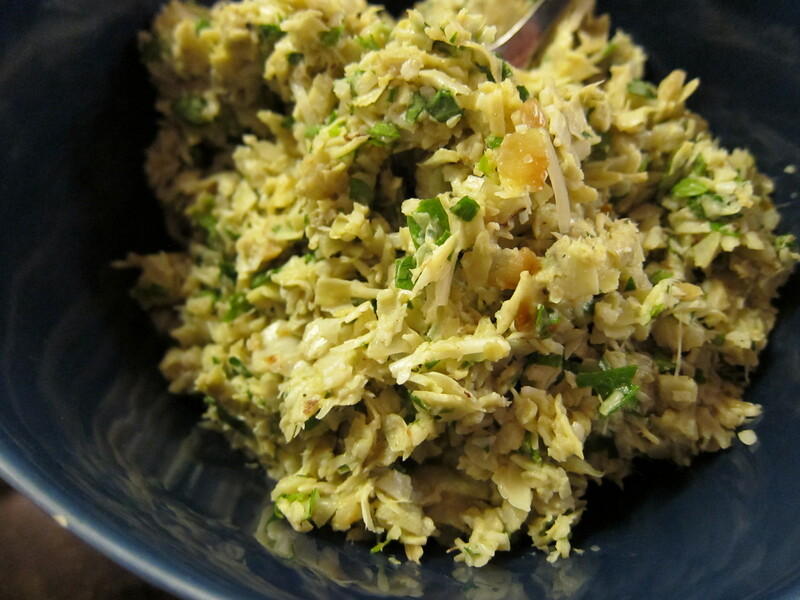 The artichoke and onion fixture are then transferred to a food processor, and processed with some parsley, Parmesan cheese, and freshly grated nutmeg. The filling is set aside until ready to use. 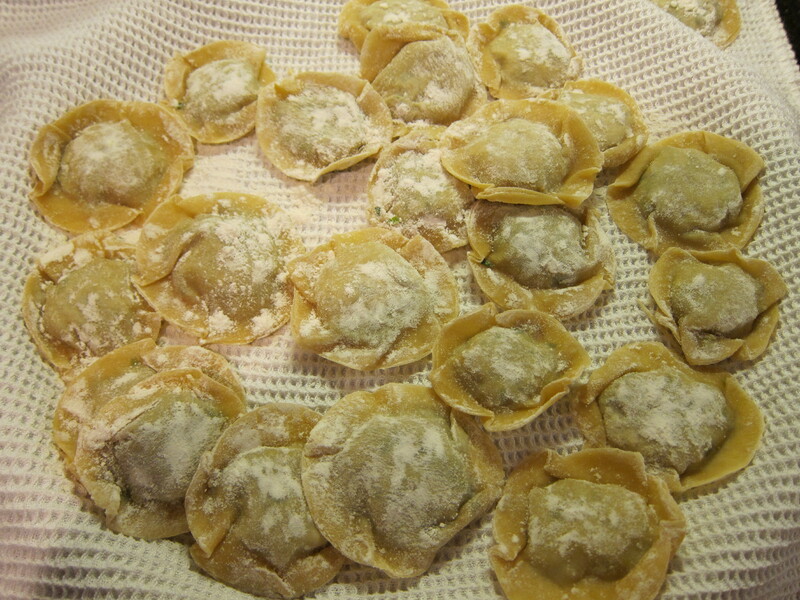 There was a ravioli recipe I made from Food and Wine that I liked a lot, so I substituted that recipe for the dough. 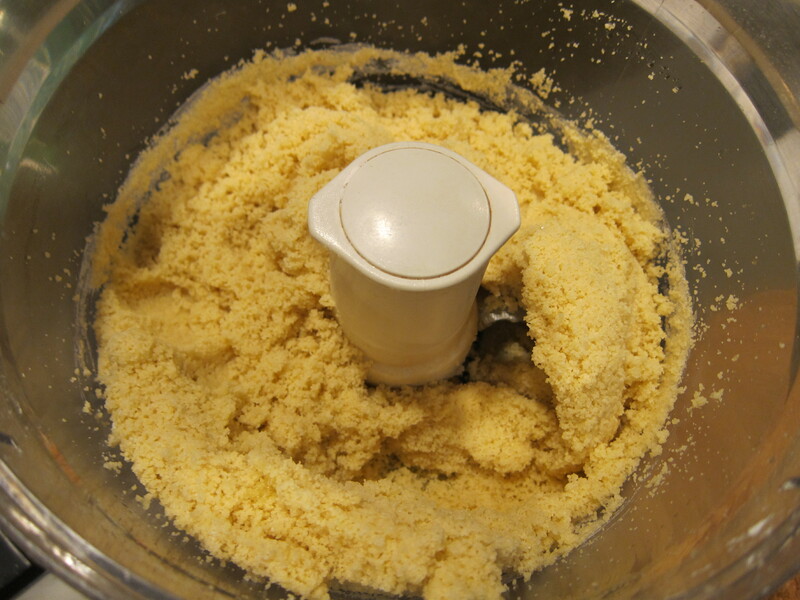 To make the dough, flour, eggs, grated nutmeg, salt, and oil are processed together until moistened crumbs form. 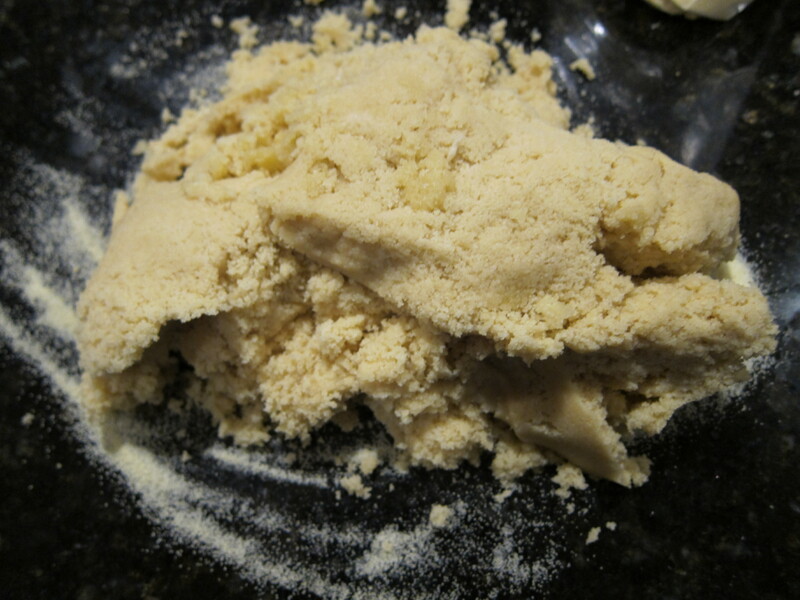 And then the dough is scraped out on to a floured surface. You can knead the ball a few times and form it into a ball. The ball is wrapped plastic wrap and chilled for at least 1 hour until ready to use. The dough will take this time to relax. 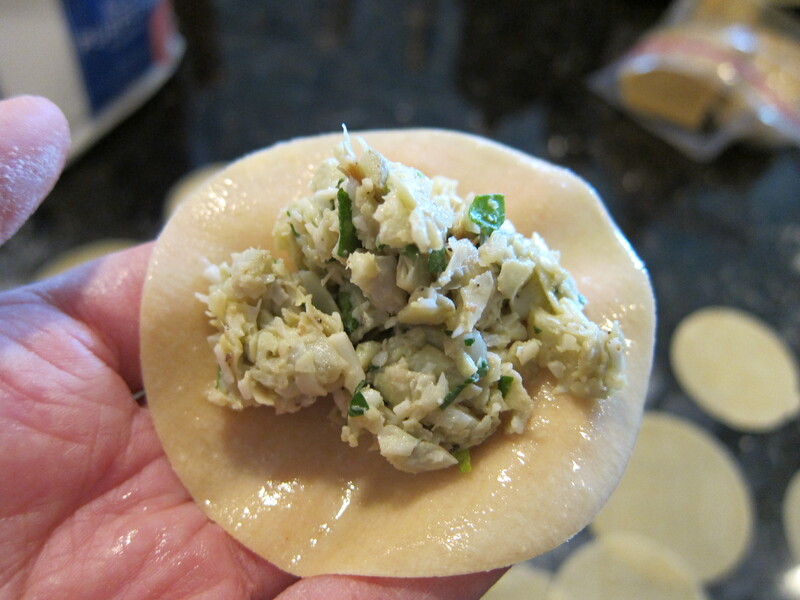 When ready to make the ravioli dough pieces, first you split the dough ball in four pieces, and wrap the pieces that you are not using so they don’t get dried out. 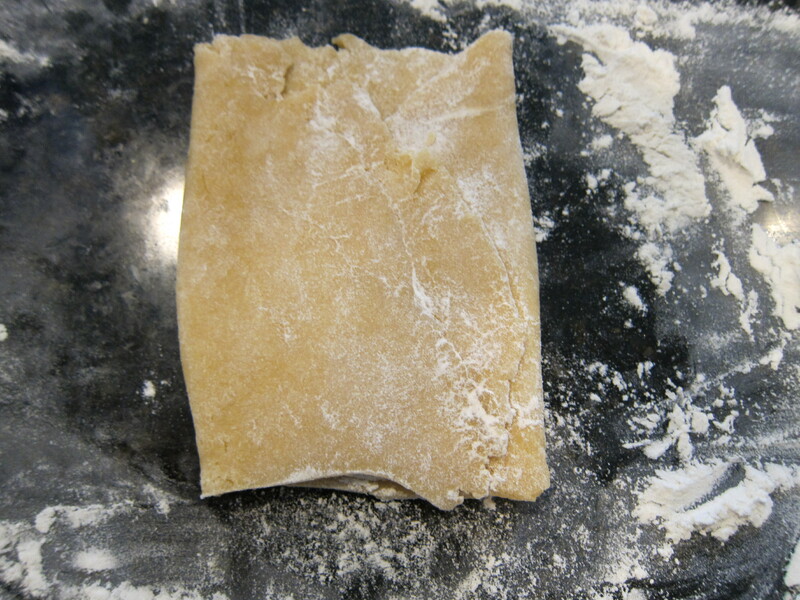 To begin with, you flatted the 1/4 of the dough into a rough rectangle, then fold the rectangle in thirds like a letter. This folded rectangular piece of dough is then passed through the largest setting of the pasta press machine. You do this twice and then move on to the next setting. 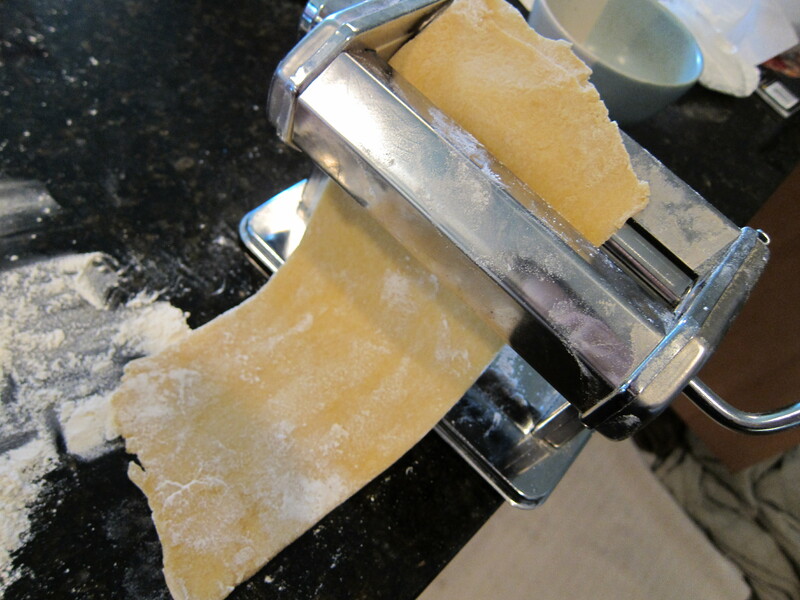 My pasta press machine is hand cranked and has 9 settings, 9 being the thinnest. I like my ravioli dough just a little chewy so I stop on setting 8. Any thicker will be too thick. 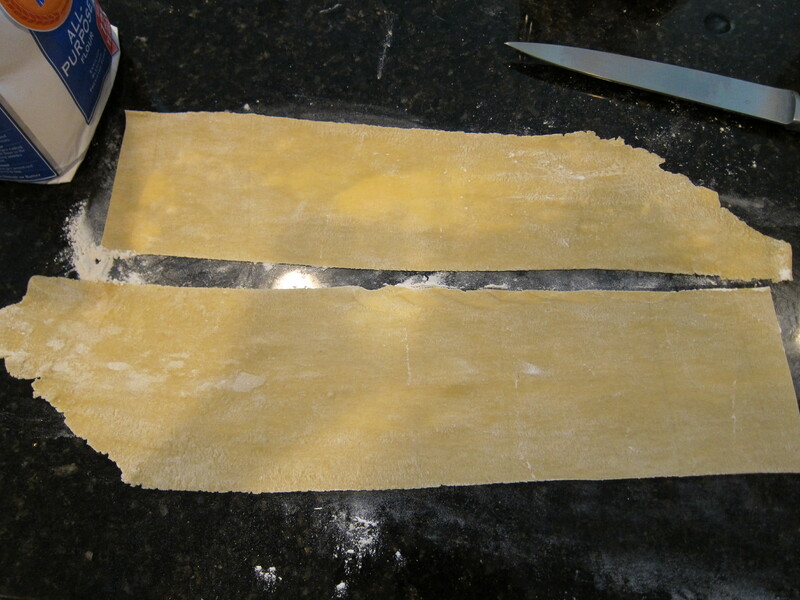 If your pasta dough piece gets too long, you can cut it in two pieces and proceed that way. I used both cookie cutters and small can bottoms to stamp out my ravioli skin. I like having variation in sizes for my ravioli. Be sure to cover the cutout pasta skin as you work, or else they will get way too dry. 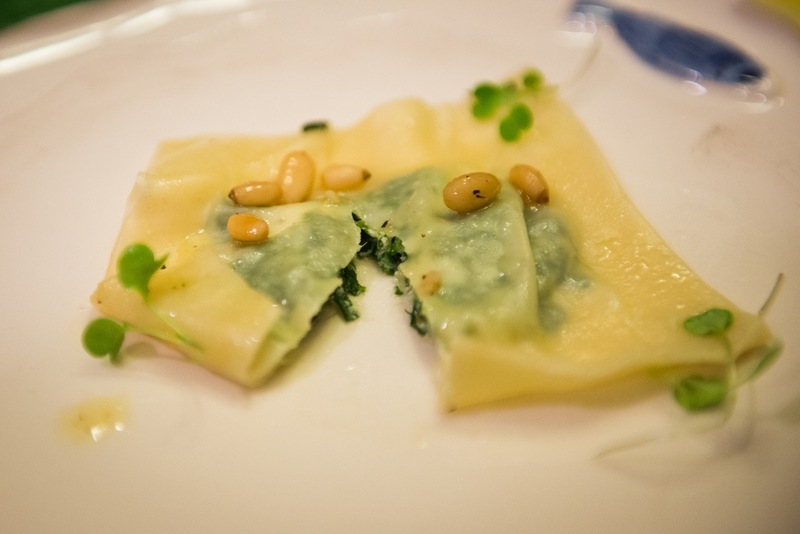 When you are ready to assemble the ravioli, take one piece of ravioli skin, brush it with some egg whites. 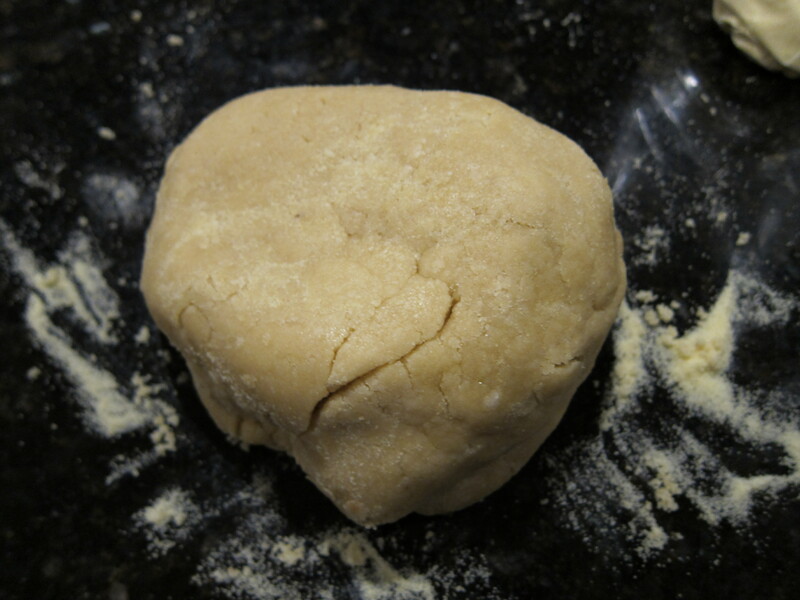 Put about a teaspoonful of filling in the the center of the dough. 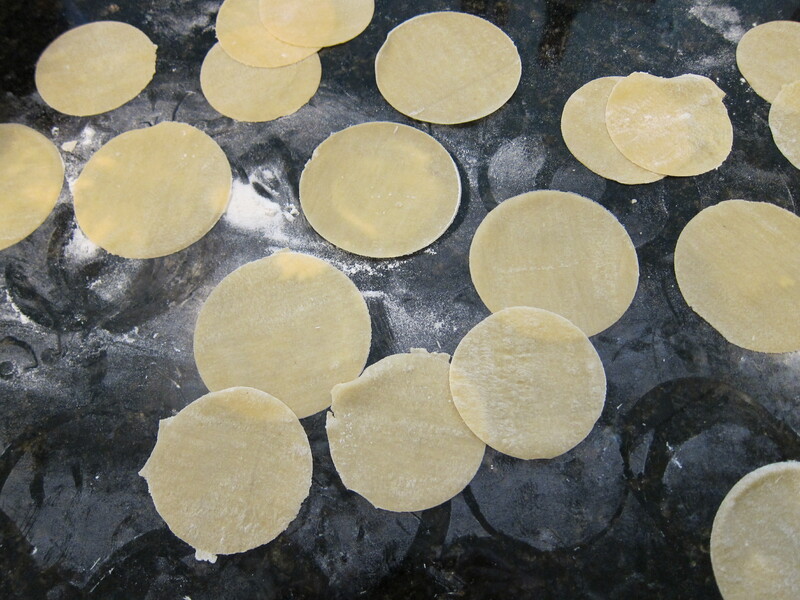 Take another piece of ravioli skin and cover the filling with it, pressing on the edges gently. The egg wash will help the sides to adhere. 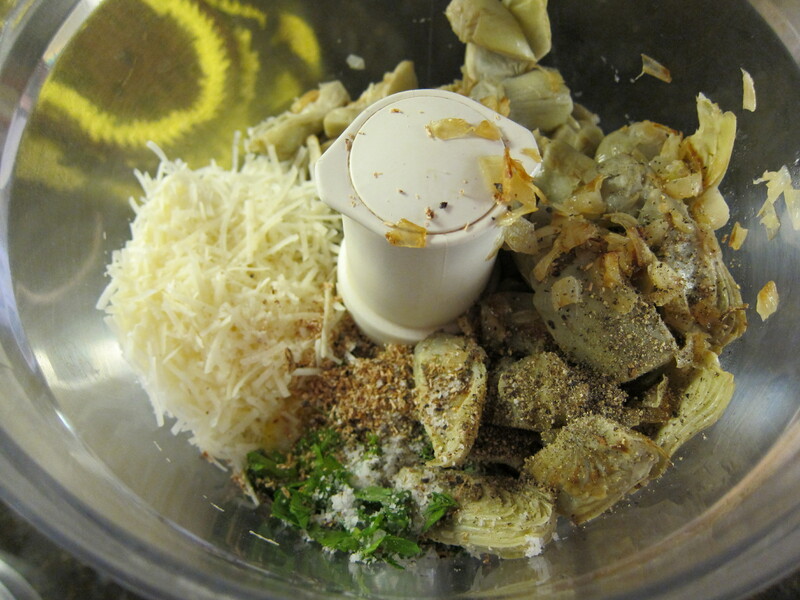 Make sure you dust the assembled ravioli with plenty of flour, other wise the ravioli will stick together. 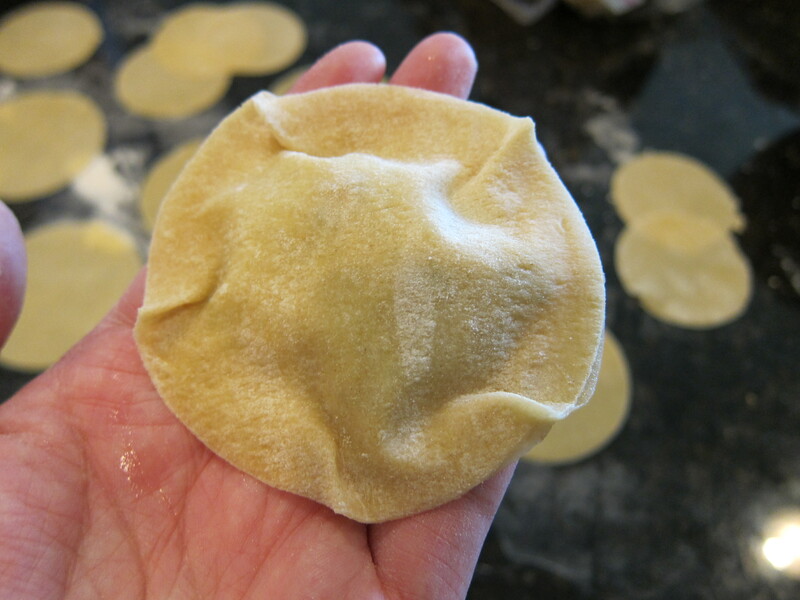 If the ravioli is make ahead of time, you can cook what you want that day, keep the rest in the fridge, or if you know you are going to eat it a few days later, you can freeze the ravioli at this point. The cooking time is about the same for frozen ravioli as the fresh. 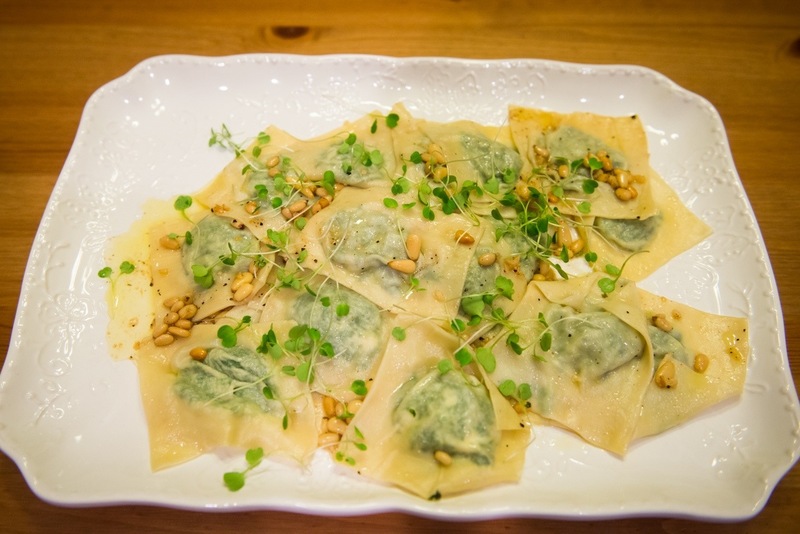 The ravioli is cooked for 5 minutes in boiling water, then drained and oiled and set aside for the sauce to finish. 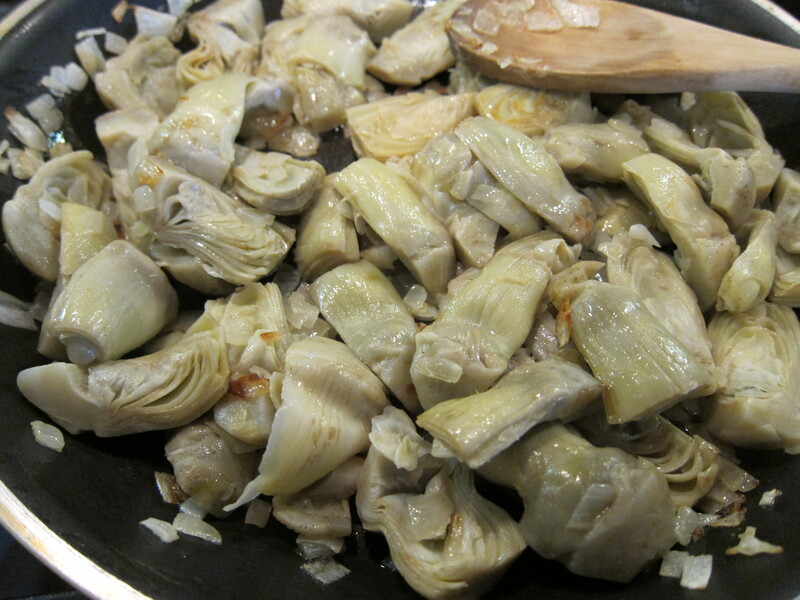 To make the sauce some tomatoes and artichoke heart spears are cooked together in a pan, half of the raviolis are placed in a baking dish, drizzled with half the artichoke and tomato mixture and a little bit of cream. 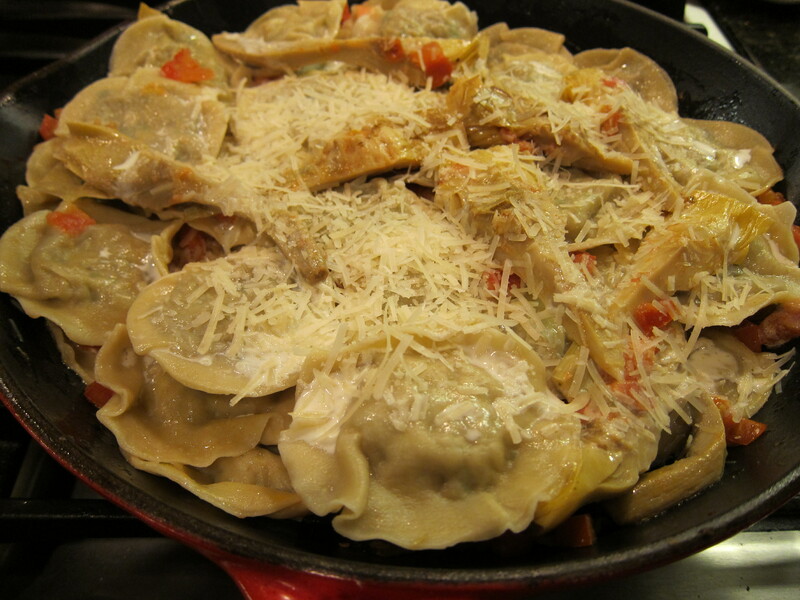 The other half of the raviolis are placed on top, drizzled with the rest of the artichoke and tomato mixture, some cream and a little parmesan cheese. The dish is placed in the oven and baked until the cheese has melted.